The farmhouse. : Casanuova is situated in the middle, far left hand side of the above picture titled “View of Casanuova’s countryside & coast”, while the owner’s medieval tower is situated in the middle of the same picture:You can see picture on request. 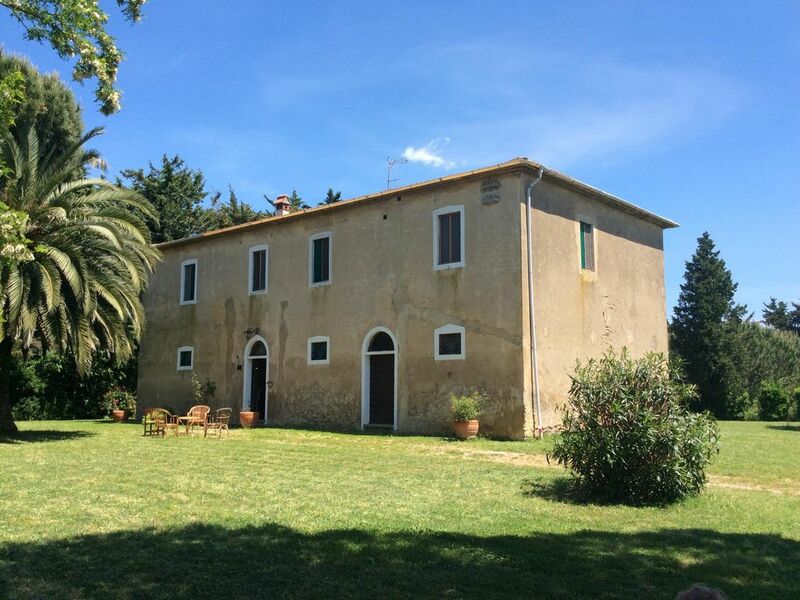 Casanuova has five bedrooms and three full bathrooms. It’s on two levels, has terra cotta tile flooring throughout, and is furnished with some rustic antiques. The rooms are spacious with high ceilings and exposed old wooden beams. All three of the bathrooms are large, one has a shower and two have bathtubs with hand held shower wands. All of the windows have moskito screens and there are electric space heaters. Ground floor anf First floor. : On the ground floor there is a spacious dining room with a table for 14 and large doors that open to the garden. The ground floor bedroom has a queen bed (two twins made together). Next to this bedroom there is a bathroom. Next to the latter there is a laundry room. The former stable, which occupies half of the ground floor’s space, has been turned into a spacious patio room with garden furniture. First Floor: stairs lead up to the first floor, which has a large, fully equipped kitchen with a dining table, a spacious living room with a brick fireplace, four bedrooms, and two full bathrooms. One of the bedrooms has a queen bed (two twins made together) and an en suite bathroom. There are two bedrooms with two twin beds and one bedroom with a single bed. The other first floor bathroom is between these bedrooms. Beaches and other. : BEACHES: it’s about 3 minutes to the sea from Casanuova, which is equipped with beach umbrellas and towels. Guests enjoy parking bordering the sand beach of a tourist resort. There are plenty of other nice sand beaches in the area, such as the unique one of the Baratti Bay and the very long one of the Rimigliano Natural Park. You must not miss the fabulous experience of the rocky seaside Buca delle Fate edging the Baratti Bay. OTHER: A restaurant pizzeria ( take away pizza if you desire ) is situated 800 meters from the entrance gate. Beautiful Large and Fenced .Grass is well cut. Outside the fence nature. HOUSEKEEPER: A very kind and efficient maid who lives nearby, is included in the rental rates. She comes to Casanuova every morning (excluding Sunday) for three hours to clean up, make beds and wash. Upon arrangement, she may work extra hours cooking exquisite Tuscan and Emilian (for example, hand made 'tortelli') food for an additional fee. GARDEN: surrounding the country house is a large and ventilated fenced garden, illuminated at night, perfect for children, with pine, palm, and eucalyptus trees, a grape vine covered pergola shadowing an outdoor table for dining al fresco, a barbeque, garden furniture, a ping-pong table and an old well. In the garden you will enjoy a very peaceful and relaxing atmosphere, chatting, eating and drinking with family and friends, sun bathing or, simply, taking a nap. The garden's location is vey fortunate, being pleasantly ventilated even in the hottest summers. We have spent wonderful 2 weeks in Casanuova in June. The house is big enough to host up to 10-12 people with dedicated bedrooms for everyone. At first the impression was somehow mixed up as we were the first guests to come to the house after a long break. The air in the house was a bit stuffy but after we have opened all windows it was fresh and light again. The house is very airy in fact as it has windows on all 4 sides of the building. The other thing we liked a lot is the interior style, terracotta floors. However, there is some space for improvement. Some parts of the furniture is really broken and this should be fixed somehow to be pleasing to the eye again (e.g. sideboard doors in the kitchen). Some of the wardrobes were missing door handles making it tricky to open the dense wooden doors. We would also recommend to consider renovating bed in a small room (1 single bed on the top floor) and renovating the bed in the bedroom on the ground floor as they are too high and not very comfy. Besides of that the overall impression was very pleasant. First several days it was not very comfortable as the cleaning ladies were coming at 8am every morning while we were still trying to catch last pieces of night dreams :) Later we have agreed with the owner to shift the service hours closer to the daytime and this has sorted things out. At the end we were very happy with the service provided, especially at the days when our dishwasher went accidentally out of service (ladies were cleaning/washing everything by their own). The house is located on a huge private piece of land so you can be sure that there will be nobody jogging around. Beach is only ~1500 meters away from the house and you can either take a walk through the private path (~20 minutes) or drive a car using a private shortcut. Alessio's daughter had a birthday during our stay and it was very nice to be invited to the party among Alessio's family friends. We've spent a wonderful day at the beach party. Alessio was always open to the questions and helped a lot with some advice on the local area. Do not miss the guest book in the property - it has many nice tips to do and visit in the area. One of our favorites was the walking path from Torre Nuova to Baratti beach. My family and I stayed here several years ago and couldn't have been happier with our arrangements. The Villa was in wonderful condition and Theresa was so wonderful and very tidy. There were 6 adults and 4 children, and we all fit very comfortably. The Villa was close to the beach and surrounded by a beautiful countryside. I am hoping that we will be able to go back to San Vincenzo and stay here again. Other Activities: thermal pools with spa, good food experiences,Flying small Aeroplanes.